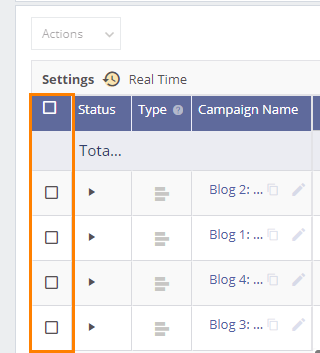 When viewing your dashboard, all of your campaign metrics will be housed under the ‘By Campaign’ tab. The “Status” and “Delivery” columns will tell you if the campaign is running or not, as well as the reasoning behind it. 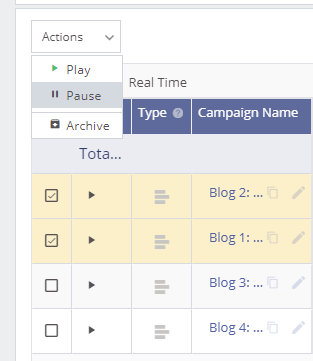 Play, pause, or archive a campaign in the “Status” column. When pausing, the campaign will remain offline until you choose to change the status to “Play”. You can also select “Archive” if you no longer wish to display the campaign in your dashboard. You can also select up to 25 campaigns at a time to change their actions in bulk. 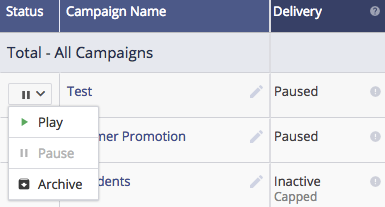 Once you select the campaigns, click the Actions drop-down menu to choose the action you want. You can Play, Pause, and Archive campaigns in bulk. Why is my campaign paused? If you’re unsure why your campaign is paused, check out the “Delivery” column. “Paused” delivery means that you have taken your campaign offline. If you wish to activate the campaign, you can do so by changing the Status to “Play”. Why is my campaign inactive? You can hover over the “!” icon next to the “Delivery” status to view a specific note about why the campaign is inactive. If you’re still unsure why your campaign is not running, feel free to reach out to our amazing support team for more assistance. Where can I find my old campaigns? After 3 months of inactivity, campaigns will automatically be archived by our system. You can still access any archived data by clicking the “Include Archived” button above the data visualizer. From here, you can export older data and review your metrics at your leisure. While you can request to have an older campaign unarchived, we recommend creating a new campaign rather than unarchiving ones that have been disabled for longer than a month. A new campaign will be circulated amongst the most up-to-date audience metrics without prior campaign data influencing the outcome. Your campaign will then have a better chance at performing on the network and finding the best audience and publishers. If you’d prefer to restart your archived campaign, please reach out to the Support team with your account and campaign name.